Welcome to the another post in the Earning Stories series right here on Rewards Canada. For years we have provided you with the details on earning points and miles (both regular earning and bonus opportunities) and these stories show the actual offers in action. 1000 bonus miles on weekday rentals of 3 consecutive paid days or more, and on a weekend rental of 2 consecutive paid days or more. A weekend rental must be picked up after Thursday 4pm, local time. Available at participating locations worldwide. 1000 bonus miles on select vehicles, including Specialty (Group X), SUV’s (Groups W, F, Z, L), Vans (Group V), Luxury (Group H), Convertibles (Group K) and Premium (Group G) vehicles. Excludes Economy (Group A), Compact (Group B), Intermediate/Midsize (Group C) and Full size (Group D, E). Available at participating locations in North America. 500 bonus miles on rentals that are prepaid at the time of reservation via avis.com/ca, or via the Avis Call Centre. Available at participating locations in North America. 500 bonus miles on Rental Option / Coverages purchased including: GPS by Garmin, Sirius XM Satellite radio (US only), Child Safety Seats, Travel Tab Adventurer, Extended Roadside Assistance (RSN), Loss Damage Waiver (LDW), Personal Accident Insurance (PAI), Personal Effects Protection (PEP), Additional Liability Insurance (ALI – US only). Bonus will be awarded one time only, per rental agreement, regardless of the number of Rental Options / Coverages purchased. Available at participating locations in North America. 500 bonus miles as a Status Member. 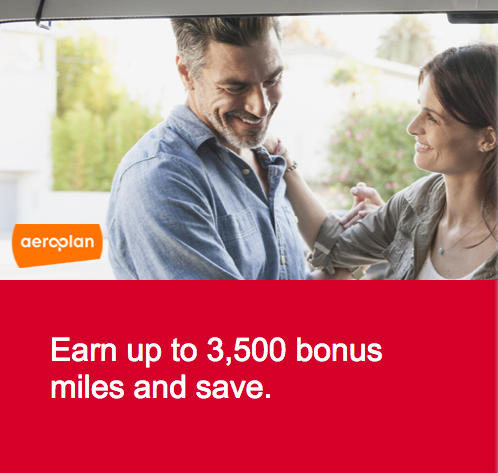 A Status member are those with Aeroplan Silver, Black or Diamond status only. The booking was simple via Avis.com and when we arrived much to our surprise instead of the Ford Escape or equivalent that we had booked they put us in a nice BMW X3. Overall I think this was yet another good earning action for an inexpensive rental and is always nice to boost an account especially in this day and age when more and more programs are going revenue based and making miles actually harder to earn by flying so you have to make use of these partner offers. You can find more Earning Stories listed here!